The neuroscientific study my research team NeuroCine initiated at the Aalto University some years ago has been published in NeuroImage journal. 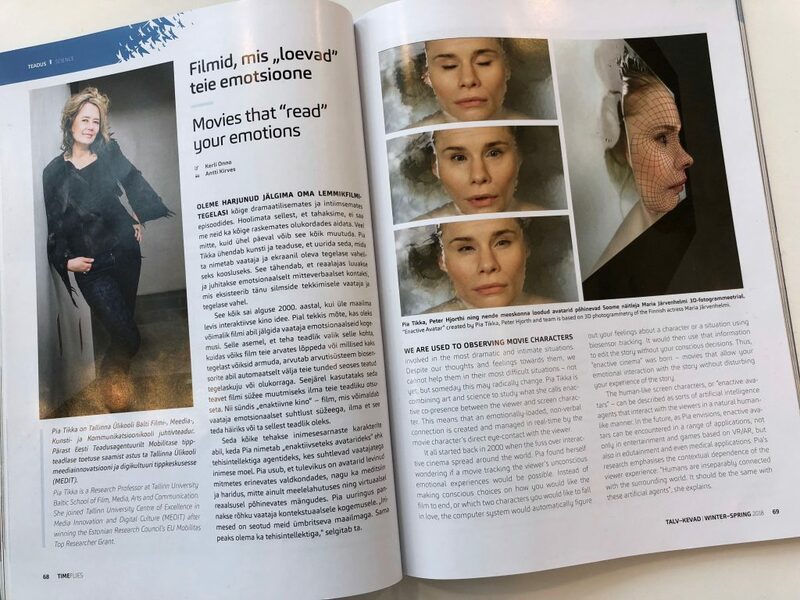 You can find an article about prof Pia Tikka and her studies on enactive co-presence between the viewer and screen character in the Nordica in flight magazine “Time Flies”. At the Politecnico Milano, School of Design, professor Pia Tikka (MEDIT/BFM) and Ilkka Kosunen (MEDIT/DTI – in image on the right) are running their workshop week with a group of 40 students of Communication Design. The topic is as challenging as thrilling: “Enactive Mind and Media”. In addition to providing the students at Polimi new insights to Enactive media and biosensor-driven interaction design, the workshop also contributes to the international dissemination strategy of the EU Mobilitas Pluss Top Research project by Dr. Pia Tikka. Ilkka Kosunen’s travel is funded by Erasmus Mobility, TLU. The workshop utilizes (DTI) Digital Technology Institute’s biosensor technology and expertise. During the workshop also contacts with the local hi-tech researchers and industry are created. A great news is that the bilateral agreement of Erasmus Mobility for Staff Exchange has been established between Tallinn University BFM and Politecnico Milano School of Design starting 2018 January. The agreement was initiated at TLUby Enactive Virtuality Lab. 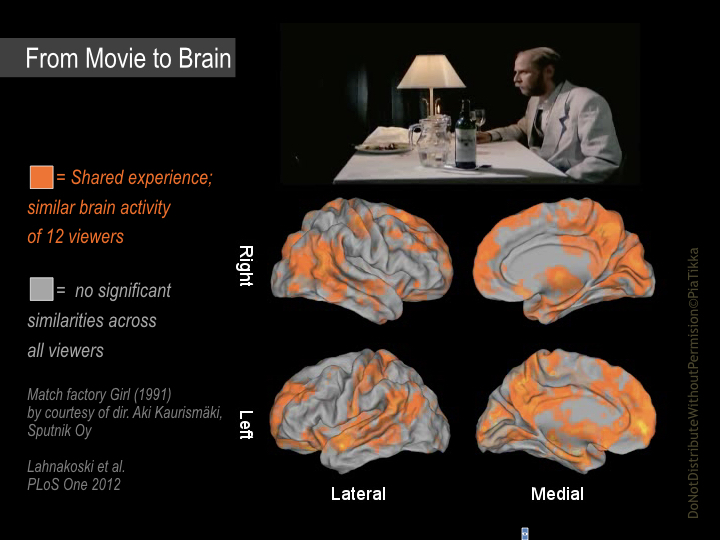 My interview on neurocinematic topics was flavoured by watching a powerful scene from Aki Kaurismäki film Match Factory Girl, which we have shown to elicit broad whole brain activity in several viewers (orange colour) in functional MRI. 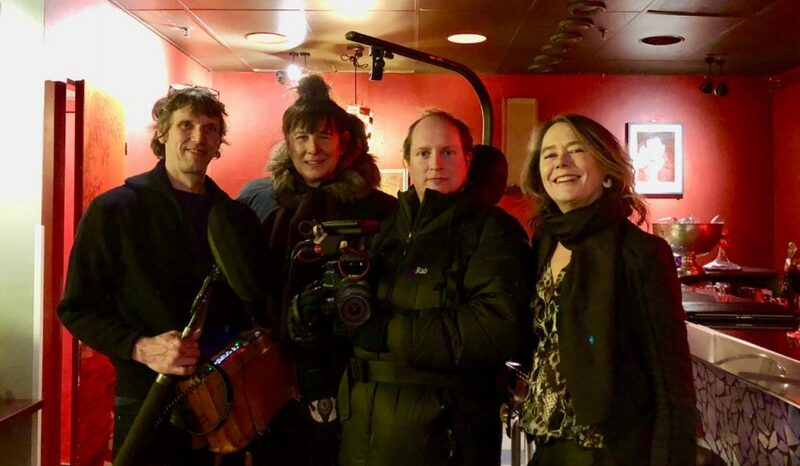 This research was conducted at the aivoAALTO research group at Aalto University (2009–2014), and AK’s film was the first that our neurocinematic team took into brain imaging lab.